It’s the dreaded allergy season. Everyone in my family has been sneezing for weeks! So I thought it would be a good time to look into what are some of the best-selling over-the-counter meds, as well as give you some tips to minimize the suffering. Top 10 OTC brands for cough, cold, allergy and sinus in the U.S., by revenue in 2014. Wear a pollen mask if you do outside chores. Check your local TV or radio station, your local newspaper, or the Internet for pollen forecasts and current pollen levels. If high pollen counts are forecasted, start taking allergy medications before your symptoms start. Oral antihistamines. Antihistamines can help relieve sneezing, itching, a runny nose and watery eyes. Decongestants. Oral decongestants can provide temporary relief from nasal stuffiness. Only use nasal decongestants for a few days in a row. Longer-term use of decongestant nasal sprays can actually worsen symptoms (rebound congestion). Nasal spray. Cromolyn sodium nasal spray can ease allergy symptoms and doesn’t have serious side effects, though it’s most effective when you begin using it before your symptoms start. Combination medications. Some allergy medications combine an antihistamine with a decongestant. Rinsing your nasal passages with saline solution (nasal irrigation) is a quick, inexpensive and effective way to relieve nasal congestion. Rinsing directly flushes out mucus and allergens from your nose. I hope that helps. I’ve used some of these tips with my own family. I also wanted to mention that we had our first live Facebook chat this past Tuesday. Unfortunately, we may not have picked the best time for it. We’ll have some news on other things we’ll be trying in the very near future. Stay tuned! Today is Earth Day! I hope you do your part today and every day to Reduce, Reuse, and Recycle. The Earth – and all of its inhabitants! – is counting on you. To celebrate Earth Day, the NCP team will be having a special event later today. We’ll try to take some photos to show you next time. If your town or city has a recy­cling pro­gram, participate in it! Choose wisely before pur­chas­ing: Repair and mend items rather than replac­ing them, and buy used items instead of new when appropriate. Sell, give away or donate reusable items instead of throw­ing them away. Carry your own reusable shop­ping bags. Buy respon­si­bly: Avoid over-packaged prod­ucts and choose prod­ucts with recy­cled content. Drink tap water or fil­tered water rather than bot­tled water and fill reusable bot­tles for bev­erages to go. Use reusable (wash­able) dishes and uten­sils and cloth tow­els and nap­kins instead of sty­ro­foam, plas­tic or paper products. Can­cel unwanted sub­scrip­tions and opt out of junk-mail. 716: The number of wind, geothermal, biomass, solar and other electric power generation business establishments in 2012, more than double the number of establishments (312) in 2007. 26 minutes: The estimated average time workers age 16 and older across the country spent getting to work in 2014, up from 25.8 minutes in 2013 and 25.7 minutes in 2012. 904,463: The estimated number of people who rode a bicycle to work in 2014. This comes out to about 0.6 percent of the American workforce. 4,011,094: The estimated number of people who walked to work in 2014. This comes out to about 2.7 percent of the American workforce. Don’t forget to join us for our first Facebook chat on Tuesday, April 26, at 2 p.m. ET. Remember to Be Green! Have a great day. Happy tax day! OK, I’m kidding. April 15 is the traditional day your income taxes are due, although this year that date has been extended to Monday, April 18. The week of April 15 is the busiest single week for tax filings, according to the Internal Revenue Service. Nearly 13 percent of taxpayers put off filing until the last week possible, more than double the 5 percent average through the month of March. Three percent of filers get around to it in the weeks after the April filing deadline and another 9 percent file for extensions and finish up in October and November each year. The average refund issued to date is $3,053, which is $5 more than last year. In 2014, federal, state and local governments collected a combined total of $4.7 trillion in taxes, or an average of $38,317 for every household in the U.S. So with that, I wish you many happy “returns”! Since this is the beginning of baseball season, I thought I’d dedicate this blog to the summer game. We are a New York-based company, so most of the people here are either a Mets or a Yankees fan. I was curious how people felt, so we polled all of our NCP staff, asking them if they preferred the Mets or the Yankees. I will be saving up my money to try and get to a game or two this year. What about you? Are you planning to go to some games this year? What do you think about the price of going to a game? Comment and let me know what you think. March Madness Is Almost Over: Who Do You Think Will Win The NCAA Men’s Basketball Tournament? Now that we’re down to the Final Four, we were wondering who YOU thought would win the championship. So please select one of the choices below and see what your fellow panelists have to say. Baseball season starts soon. What teams do you follow? Do you follow any other sports teams? Let me know! It’s Finally Spring – Anyone Up For Some Spring Cleaning? Well, spring has sprung, and to many that means Spring Cleaning! 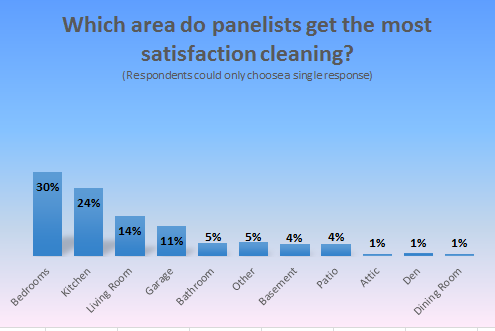 We recently surveyed our panelists asking them their opinions about spring cleaning. Here is some interesting information from the survey. 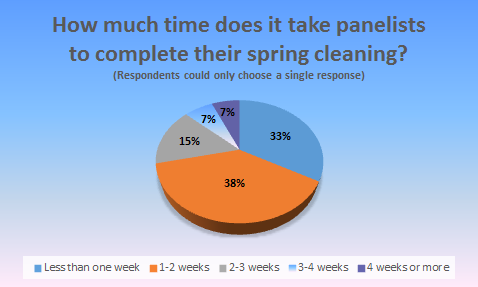 38.7% said they follow a tradition of spring cleaning their home when spring arrives. St. Patrick’s Day is almost here – and you don’t even have to be Irish to celebrate! The world’s first St. Patrick’s Day parade occurred on March 17, 1762, in New York City, featuring Irish soldiers serving in the English military. According to the U.S. Census Bureau, 33.1 million people, or 10.4% of all U.S. residents claimed Irish ancestry in 2014. This number was more than seven times the population of Ireland itself (4.6 million). Going out to celebrate? There are plenty of places to go. According to the Census Bureau, in 2013 there were 235,701 full-service restaurants and 41,582 drinking places (bars and taverns) in the U.S. According to the National Retail Federation (NRF), more than 125 million plan to celebrate the day and are expected to spend an average of $35.37 per person. Total spending is expected to reach $4.4 billion. There are many ways to celebrate. According to the NRF, 82.1% of those who responded to a survey said they will wear green to show their Irish pride, 31.3% plan to make a special dinner, 28.7% will head to a party at a bar or restaurant and 21.1% will attend a private party. In addition, 22.8% plan to decorate their homes or offices in an Irish theme. According to the NRF, 56.5% of those celebrating will purchase food and beverages, 28% will buy apparel or accessories, 23.3% will buy decorations and 17.2% will buy candy. As you can see from my avatar, I’m certainly in the spirit! I hope you enjoy the holiday, too. But remember to be safe in whatever you may do. On Sunday, March 13, at 2 a.m., we turn the clocks ahead and that means, among other things, more daylight in the afternoons. But it also means one less hour of sleep. I’m tired just thinking about it! Here are some other things to think about when it comes to Daylight Saving Time. Two states, Arizona and Hawaii, don’t observe daylight saving time. Daylight saving time was first used during World War I, to help to conserve fuel. The thinking was that using daylight more efficiently saves fuel and energy because it reduces the nation’s need for artificial light. About 70 countries around the world observe Daylight Saving Time. According to a University of Colorado at Boulder study, there is an increase in fatal motor vehicle accidents the first six days after the clocks spring ahead. There’s a spike in heart attacks during the first week of Daylight Saving Time, according to studies. Scientists have speculated that the loss of an hour’s sleep may make people more susceptible to an attack. When Daylight Saving Time ends in the fall, heart attacks briefly become less frequent than usual. Daylight Saving Time also means spring is around the corner. For many, that means it’s spring cleaning time! So, we want to know your opinion about spring cleaning. Be on the lookout for a Just For Fun survey regarding your spring cleaning habits. Last week I talked about how much I was looking forward to watching the Oscar broadcast. Well, it certainly was an interesting broadcast. Nielsen reported that this year’s broadcast had 34.4 million viewers, which declined by about 8 percent from last year’s telecast. This was the lowest-rated Oscars in eight years, according to Nielsen, and the third-lowest since Nielsen began tracking viewership in the mid-1970s. Did you watch the broadcast? Very interesting results, don’t you think? Thanks to all who participated. I really like watching movies, so I’m really looking forward to this Sunday when one of my favorite awards shows will be broadcast – the Oscars! I’ll be tuning in early for the red carpet preview to see what everyone is wearing! I haven’t had a chance to see many of the nominated movies, because I’ve been busy with work and family life. But, I’m still interested in finding out who wins an award. Last year’s ceremony, according to Nielsen, was watched by 37.3 million total viewers, which was the lowest-rated Oscars telecast since 2011. But it still ranked as the No. 4 most-watched program and the No. 1 entertainment program of 2015. According to Nielsen, the highest-rated Oscars show of all time was the 1998 ceremony, when one of my favorite movies, Titanic, won 11 Academy Awards, including best picture. That year 55.25 million viewers watched the show. The average cost of a 30-second ad during Sunday’s Oscars telecast is between $1.9 million and $2 million, according to Kantar Media. Those numbers are significantly larger than the average cost of a spot during last year’s Grammys ($942,000) or Golden Globes ($577,000). Hope you get a chance to see the show. It should be interesting!